Pranav Vora is the founder and CEO of Hugh & Crye, an online menswear company that helps transform themselves into modern gentlemen. He serves on the board of Indiana University's Johnson School of Entrepreneurship and enjoys helping budding entrepreneurs. He received his bachelor's degree from IU and his master's from the London School of Economics. 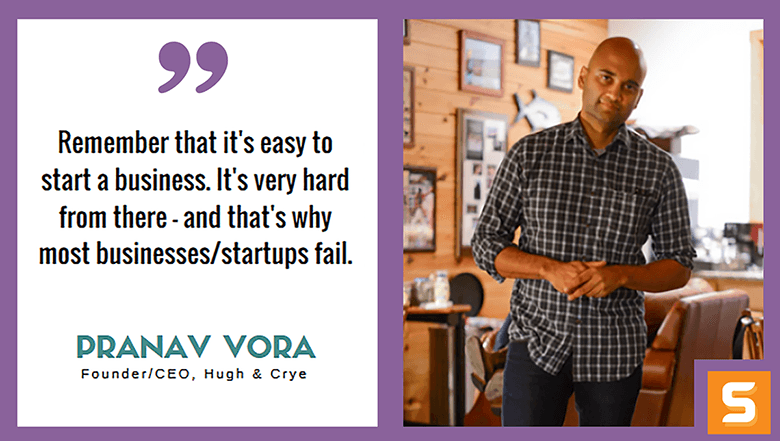 In this interview with Startup Savant, Pranav shares how he started Hugh & Crye, his toughest business decision and much more about his journey as an entrepreneur. I would first say, make sure you're really committed to whatever you want to do. You'll be tested in more ways than you can imagine. Be ready for that. CAN YOU TELL US A LITTLE BIT ABOUT YOURSELF, PRANAV AND HOW YOU GOT THE IDEA FOR HUGH & CRYE? It was a hunch that wouldn't go away. This feeling that turned into a concept, and then a product, and finally a company that had real customers. The origin was simple: it was hard to find dress shirts that fit and flattered my body. There were many, that became affirming "founding" moments along the way. One moment was early on during product development, I consulted a very accomplished pattern maker who loved our approach to sizing and suggested that the men's (apparel) category was ripe for innovation. It has changed over the years, the things that I find energizing. That said, the single thing that I can point to that has remained is our customers. Our guy tends to be a pretty educated, ambitious, active guy who is evolving himself into big life moments - marriage, fatherhood, buying a home. It's great to be evolving right along side with him. Connecting with him and helping him is something that I want to continue doing. Splitting with a co-founder very early on in the life of the company. Something that took me years to reconcile, honestly. It happened to be the best decision for the both of us, and the company, and so I don't regret it. That said, we sometimes forget that at the end of the day we are all human. Going through difficult work situations can be stressful. It has taken me a long time, but I'm much more careful now to appreciate each individual in their entirety - not just for what they do (or don't do) for the company. I wish I could tell you that I had a regimented day, but that's just not the case. That said, I've taken up a few obvious things that have really helped me: meditation and working out. WHO HAS BEEN YOUR GREATEST INFLUENCER ALONG YOUR ENTREPRENEURIAL JOURNEY? HOW DID THEY SHAPE HUGH & CRYE? For the company, probably my co-founder, Philip Soriano. He joined me just after the aforementioned split with my original co-founder. Phil brings a great commitment to people, relationships and connection to the company. Whether it's our customers, our suppliers, our partners or potential investors - Phil has a high level of empathy and naturally wants to help people. That is something that has seeped into our DNA over the years. So much so that one of our core values is "Serve each other." It's hard. I do have a hard time being present, especially when something is pulling my attention. I really value being accessible and available to my teammates - they can call me or text me whenever. WHERE DO YOU SEE HUGH & CRYE IN THE NEXT 5 YEARS? ANY NEW PRODUCTS IN DEVELOPMENT? Our mission is to help men become better. To that end, we're going to keep working on products - apparel and beyond - that help people become better, starting with ourselves. We have had a strong 5 years behind us, but for us to really ramp up the business, it will take strategic capital and growing the team with more great people. WHAT ADVICE WOULD YOU GIVE TO OUR READERS WHO WANT TO START A BUSINESS IN WASHINGTON DC TODAY? WHERE SHOULD THEY START? Hmm. Well, remember that it's easy to start a business. It's very hard from there - and that's why most businesses/startups fail. So I would first say, make sure you're really committed to whatever you want to do. You'll be tested in more ways than you can imagine. Be ready for that. To be get a closer look at how Pranav is shaping modern men via Hugh & Crye, check him out on Instagram, connect on Linkedin or follow him on Twitter.